Two-try hero James Wilson insists Saints have ‘a lot of work to do’ ahead of Saturday’s LV= Cup semi-final at Saracens. 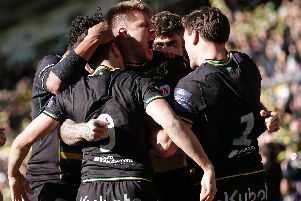 Jim Mallinder’s men salvaged a 33-33 draw from their Aviva Premiership trip to Gloucester on Saturday, scoring in the final minute to claim a couple of crucial points. Wilson’s brace allied with Samu Manoa’s last-gasp effort and 18 points from the boot of Stephen Myler means Saints now sit nine points clear at the top of the table. But they will now be desperate to progress in the LV= Cup, with a home final appearance at Franklin’s Gardens on March 22 up for grabs at Allianz Park on this weekend. And Wilson insists he and his team-mates will be grafting this week as they bid to iron out the errors that nearly cost them dear at Kingsholm. “We don’t like drawing because it still feels like a loss,” said the Kiwi utility back. “We’re pretty disappointed, particularly with that first 40, which wasn’t up to our standards at all. “It’s not how you play rugby and it’s not how you play when you go to a tough place like Gloucester.